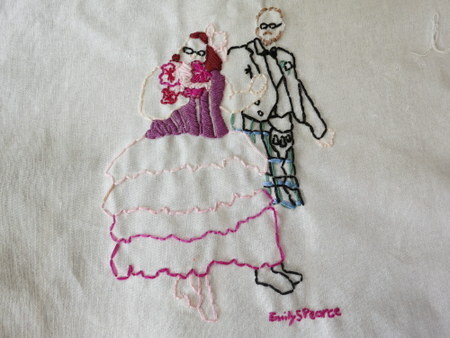 This is the story of a wedding gift (my contribution to it, anyway) for a dear friend. I thought you might like to see the process. 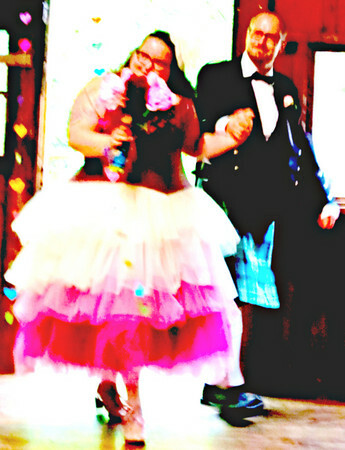 The picture is of my friend Jamie and her husband, who got married last June. 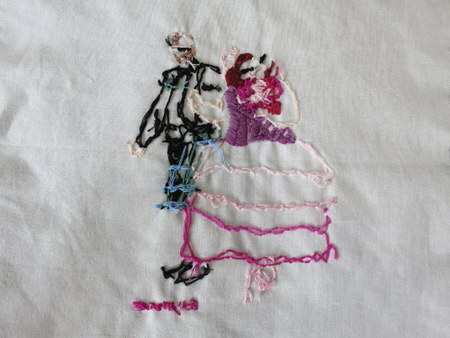 As a surprise to the couple, her mother asked friends and family each to complete a design on a muslin square. 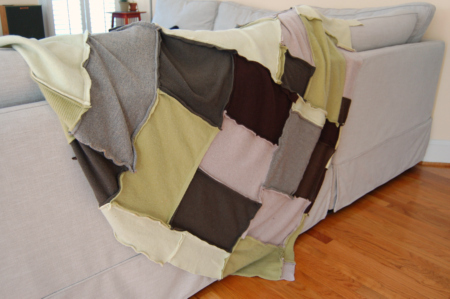 She collected the squares and then had them made into a patchwork quilt as a gift to Jamie and her husband. Jamie and I go way back, and a big part of our friendship has been about shared words. Books, movies, music, poetry, television. We have a lot of inside jokes about obscure quotes. So I sifted through our collective “library” of shared references, looking for the perfect quote to decorate the wedding square. Nothing seemed quite right. 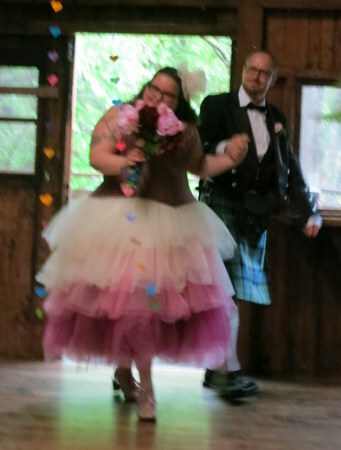 When I saw the bride and groom, though, I knew nothing could be more Jamie and Jon than their fabulous wedding outfits. I decided to make an embroidered picture and started with the best photo I had of the event. It’s blurry but gave me a good pose to work with. 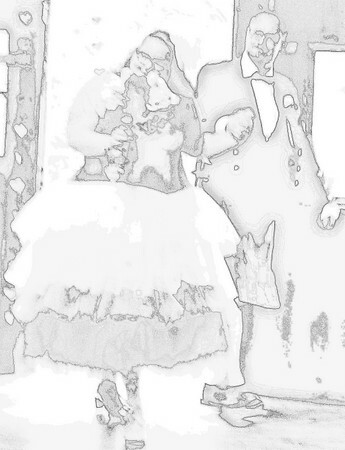 I used Picasa to play with the colors and then used the “posterize” effect to get the lines of the image to show up more clearly. I printed the picture, traced over the lines with a Sharpie, and then transferred these to the fabric with a temporary fabric marking pen. If you’re interested in seeing more of Jamie and Jon’s wedding, click here. Meanwhile, I’m hard at work on my nonfiction project and just got some excellent notes on my novel from an old friend. 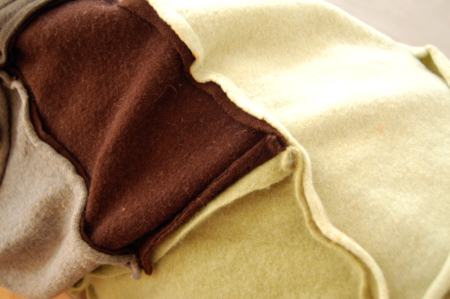 A little sewing going on, which hopefully I can show you soon. Back to writing now! The front door needed something, something that was NOT the red berry wreath that has seen better days. 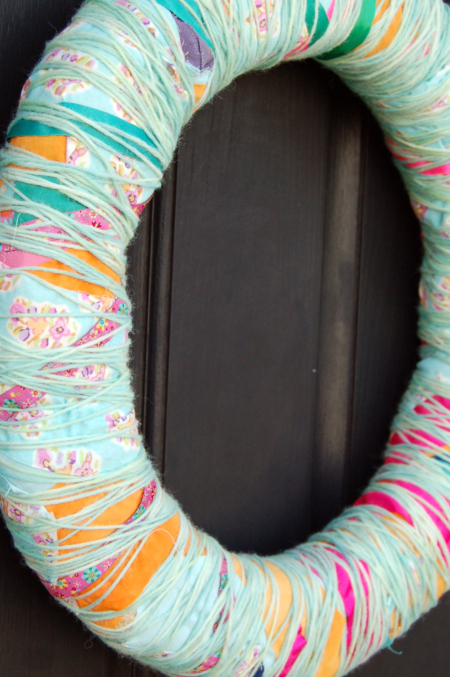 I wanted to make a wreath that wasn’t permanent, not too fussy or prim, but would give us a burst of spring color. Also, it had to be easy and quick. 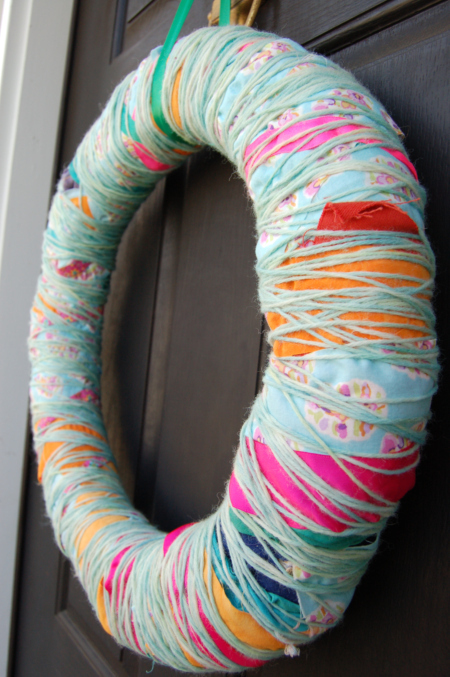 I pictured something along the lines of the ribbon wreath my daughter made last year. Or maybe a little like the Anthropologie thread-wrapped bricks I saw on Pinterest. Or the yarn-and-fiber wrapped rabbit I’d seen at the Ackland Museum Store in Chapel Hill. For the life of me, I can’t find the name of that artist or a link to her work, so let me know if you know what I’m talking about. I bought a straw wreath form at Michaels and pulled out a bunch of spring-colored scraps: leftover strips from this quilt, scraps from this dress and this one, and Kool-Aid dyed yarns. I started wrapping and pinning on the darker color strips, hoping a little dark poking through from the bottom layer would keep the color scheme from getting too saccharine. Though in the end there’s actually very few darks to be seen. Next came the lighter and brighter strips, then the ribbons. Last, I started wrapping the yarn, but my five-year-old was really into that part, so I let him wrap until the whole thing had a good spreading of yarn. In the end, I’m fairly happy with the results. It hit all my requirements, though it didn’t quite match up to my vision. Hubs wasn’t so sure about it at first, but it’s grown on him, he says. Either that or he just wants to make sure I make his favorite chicken salad this week. For more of my posts about crafts, click here. Is it spring where you are? We had lovely weather over the weekend, and things are sprouting up in the garden. Meanwhile, I’m still inching along with the revision on my novel. I’m remembering something Katherine Paterson once said/ wrote….something to the effect that she had to sculpt her plot out of granite, using straight pins. My process is feeling something like that. I keep making headway but then realizing there’s so much more to do. What are you up to? 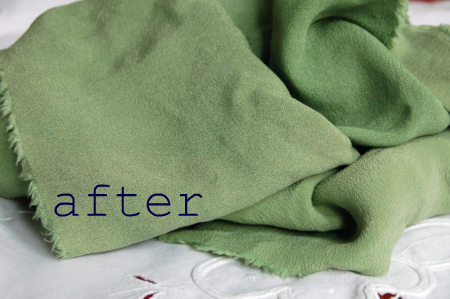 Sometime in the last few months I got it in my head that I wanted a cashmere blanket. Like, really wanted one. 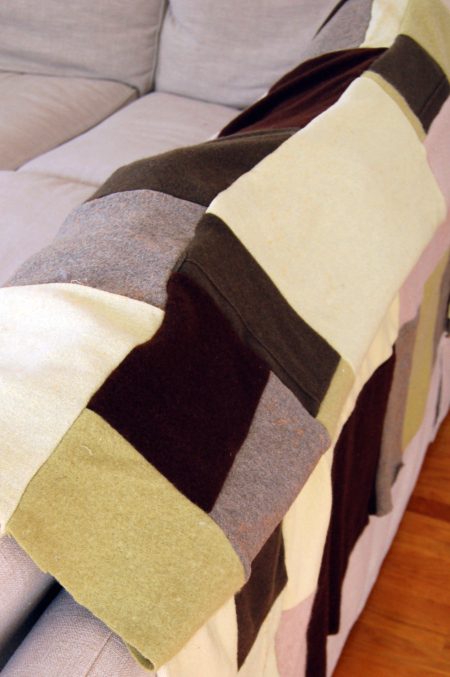 I think maybe I started obsessing when I was paging through Handmade Home and saw all the cozy, cozy stacks of blankets. I just wanted to curl up with them. I didn’t want to fork over the money for cashmere, though, so I started scheming. Could I possibly find enough thrifted cashmere to make a blanket? Sometimes it’s hard to come by, but lo and behold, there was a bumper crop of cashmere at Goodwill this fall. Some of it was in perfect condition, in my size, with classic lines. What?! I washed those and put them in my closet. The rest of it, the out-of-fashion, the holey, the wrong sizes, I cut into rectangles (excluding the holey bits) after washing it. 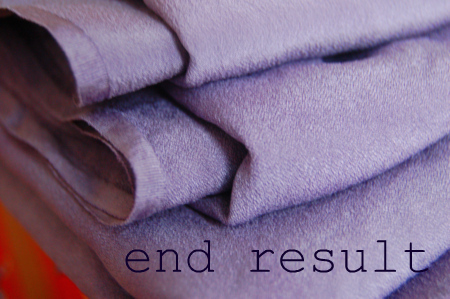 I added in a few washed and shrunken merino sweaters, too, to round things out and make the blanket a little bigger. In all I used six sweaters for the blanket. It went together pretty quickly, and the kids were very excited to help place the pieces. Everyone was already fighting over it before it was even done. I had planned to lap the edges, but kind of forgot that plan until midway through. Oh well. Next blanket, maybe. I already have some cashmere pieces waiting. Personally I like all the little weirdnesses of sweater pieces, the rolled edges, the seams and ribbing here and there. And it’s kind of nice to have a “smooth” side and a “wrong side.” I like them both. For sewing the pieces together, I used (I think) a regular machine needle and upped the stitch length a bit. I had no problems with it. 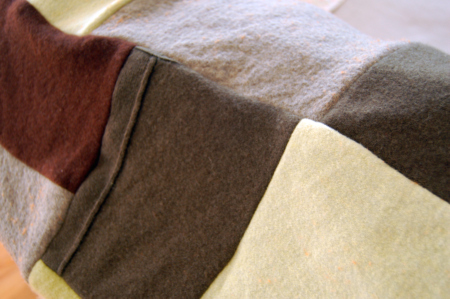 If you want specific instructions for sewing a cashmere sweater blanket, check out Betz White’s book Warm Fuzzies. Random: love loved this fire and ice birthday party over at elsie marley. Almost makes me want to live in a frozen place again. Also, has anyone been watching Parade’s End on HBO? I can’t fully follow the storyline, but wow, the clothes are incredible! 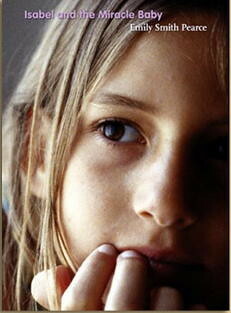 And lastly, next week I’ll be introducing you to a friend of mine, artist/ photographer Dawn Hanna. So excited! Her work is drop-dead gorgeous. Okay, folks. Have a great weekend. This is one of those last-minute inspirations that happened to work out. I was trimming bits from a Christmas sewing project (to be pictured later) and had all these great strips of cheery prints. It seemed a shame to waste them. I grabbed a balloon, blew it up just a little (you could do a bigger version if you wanted) and tied it off. Then I made a water-and-Elmer’s-glue mixture, dipped the strips, and wrapped them around the balloon, just like papier mache—-only one layer of strips, though. I left a few holes here and there, but if I had to do it again, I’d leave more holes for effect. 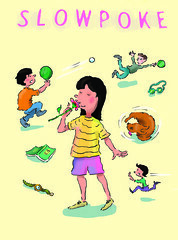 This would be a great quick craft to do with older children, though of course you have to be able to stomach glue mess. Not a problem in my case. Family members who shall remain nameless were skeptical, but in the morning, when the glue was dry and the balloon popped, it DID actually detach from the cloth and leave this little egg-shaped vessel. It could’ve dried a bit more, though. Make sure it’s dried ALL the way for best results. 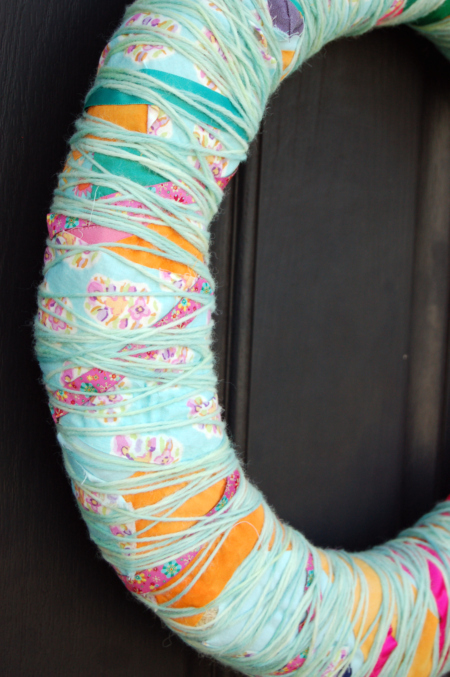 Then you just make a thread hoop/hanger thingy and presto! change-o! You’re done. Dyeing things gives me such a rush. It feels like magic, and also like haha! I got what I wanted for next to nothing! 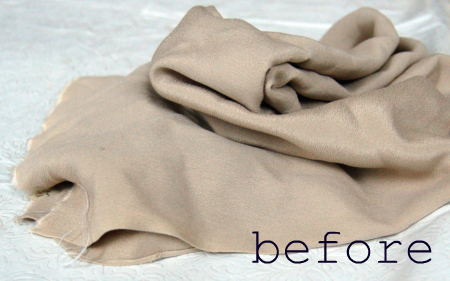 A sewing friend who was moving away (a long time ago now) gave me some silk (crepe de chine?) from her fabric stash. Silk! I’ve never sewed with silk before. But I was stumped. 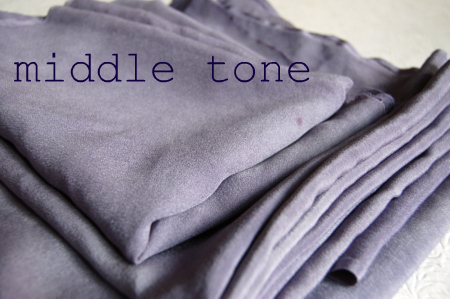 The colors are all very, very pale, and I just couldn’t imagine myself wearing them. Paleness tends to wash me out. Months later I had a brainflash. What if I dyed the silk? But silk. Silk! It took me a long time to work up my nerve. Finally, months after that, I started with a small piece and used the old Easter egg/ Kool Aid dye technique. Initially I was going to try some embroidery or resist or something to give it some more interest, but then decided to keep it simple. I ended up really liking the color. Warning, though—-this was German Easter egg dye. PAAS will work the same, but I find their colors to be a bit, well, Easter eggy—whereas this green was nice and grassy. You can always mix your PAAS or Kool-Aid colors to get something a bit more nuanced. I think there are even tutorials out there on mixing Kool-Aid colors—-usually with regards to yarn dyeing. On to silk batch #2. 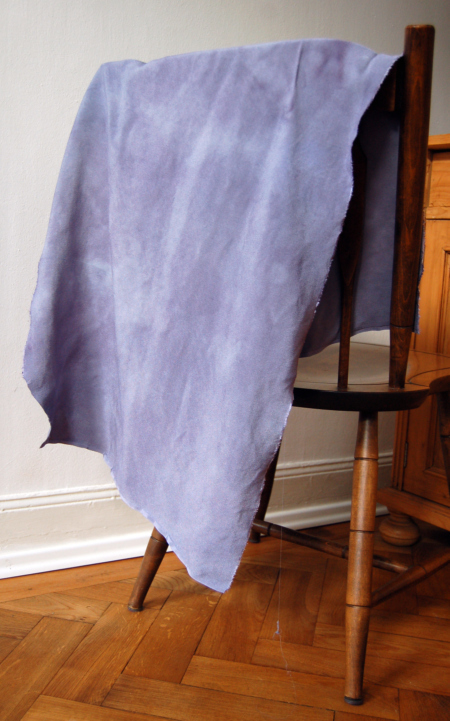 I was a little bolder this time with several larger pieces of pale blue, and decided for an indigo color using two shades of Deka fabric dye. I dyed it one more time to get a deeper color. It doesn’t show up quite true in this photo (below), but I really like the way it turned out–it’s just a tiny bit deeper than the middle tone. The mottled effect is gone, though. I’m planning to make another Anda dress out of the fabric. Wish me luck! My most recent sewing projects have not been going very well. 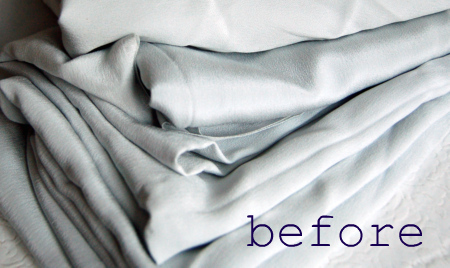 For tips on overdyeing, check out this previous post. 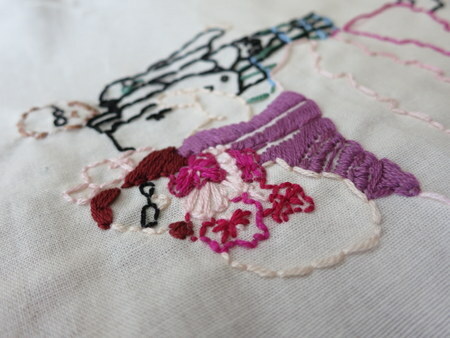 For more of my adventures in fiber art, click here.